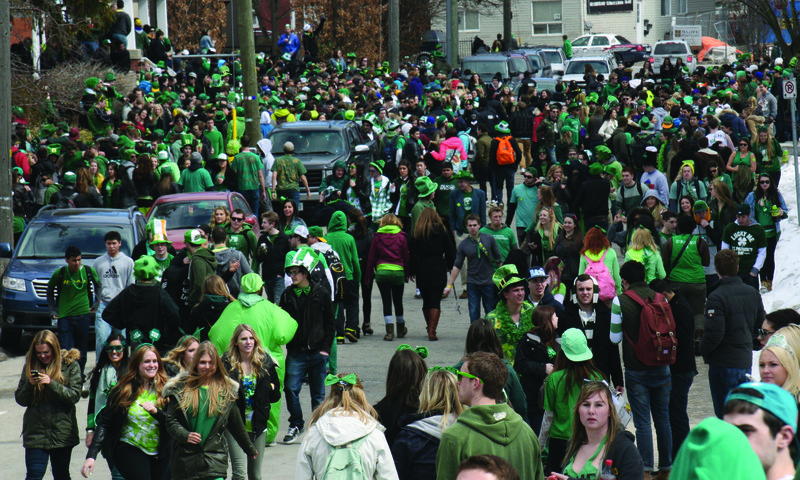 For the past few years, St. Patrick’s Day on Ezra Street has been a popular celebration for university students in Waterloo. But after a gathering of over 7,000 people last year—exceeding the street’s limit of 2,100—officials have been thinking of ways to spread out the crowd to deal with safety concerns. After a series of conversations between Wilfrid Laurier University administration, the Laurier Students’ Union, the University of Waterloo, Waterloo Regional Police Service (WRPS) and officials from the City of Waterloo, this year there will be an alternate celebration for university students. XL Lifestyle, the event planners that also organize 12 Barz of Christmas, will be creating an Oktoberfest-style event called St. Paddy’s Day at the Outdoor Pub. The event is being held on Seagram Drive. Already, 2,000 students are planning to attend with the maximum capacity being 2,500. 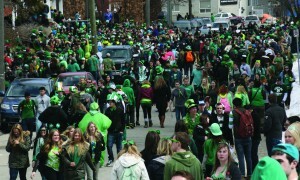 A task force comprised of the above parties was created to discuss options after last year’s St. Patrick’s Day celebration. They decided that the event with XL Lifestyle was the best solution. She explained that the Students’ Union’s biggest concern was the fact that the celebration often attracts people from all over the Greater Toronto Area, high school students and others with no attachments to the universities. After last year’s celebration, the WRPS expressed concerns that they couldn’t control the crowd and that first responders were unable to get clear access to the road. As well, $50,000 worth of damage was sustained from vandalism and robberies. “The main concern was the concentration of people on Ezra Street just got to the point where it was too dangerous and we had to do something to address that,” Kevin Chalk, deputy chief of operations for the Waterloo Regional Police Services, said. According to Chalk, only a minimal amount of people had huge safety concerns. Chalk hopes the new event will minimize the tickets given out to students drinking illegally on the streets. “Personal safety is always a first and foremost concern,” he continued. Despite the hope that the new event will detract from Ezra Street, WRPS is still planning on increasing enforcement and security on Ezra. Since the holiday is on a Monday, the Union said it’s debatable whether the event will be successful. Mike Horner and Pat McDonald, representatives of XL Lifestyle, said the event will include an outdoor heated tent, live music and food. A special mystery guest appearance, rumoured to be a DJ, will also be announced at the event. “It’s not so much we’re trying to distract students [from Ezra], but because of the initiative the city and the police are taking, we thought it was a good way to give back and a good opportunity to give the students another place to hang out to keep the party going and not be fighting with the authorities,” Horner said. According to Constantinescu, the city isn’t involved in promoting the event, as they are more concerned with having a safer St. Patrick’s Day. The Students’ Union is also doing an educational campaign with the city on what to avoid on St. Patrick’s Day, such communicating fine amounts and common infractions. “If we can educate students to avoid doing anything dangerous, that would be beneficial from a student perspective,” said Constantinescu.